The Seahawks, NFL’s best defense team dominated the NFL’s best offense team and the whole game looked like a one sided affair. In my opinion, this would be considered one of the worst games for MVP Peyton Manning, the Bronco’s Quarterback. The Seahawks played a brilliant offense and suffocating defense game to win 43-8 tonight. I was watching the game with a couple of friends. Most of them were Bronco’s supporters, Manning fans, but half of them changed their side by halftime. And wow! What a stunning halftime performance, one of the more energetic Super Bowl performances in recent memory! On a personal front, I ran more than half marathon distance today as per my training schedule for the Feb 9th half marathon. The weather was not that conducive for running in the Houston area today, it was cold, windy and drizzling outside and therefore I decided to go on the treadmill instead. 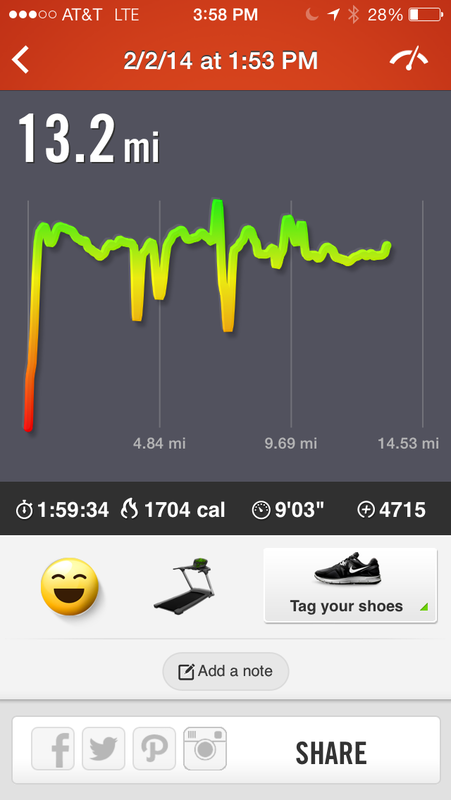 Although I prefer running long distances outdoors, I ran 13.2 miles on a treadmill today. Can’t complain about that. Great job on your run. I hate the treadmill so I never use them, pretty impressive to log 13+ miles on that thing. Good luck at your half marathon. I don't like treadmill either but there was no other option. Glad I ran the distance as per the running plan.. I read your blog and noticed you are seasoned and very active runner. Please let our readers know too how much distance you run every day by posting your comment on the “Run Diary” tab. I am looking to motivate folks in our community to take some interest in running.